Ideal for fire pits and fire rings larger than 36"
Feeling woodsy? Want your fire pit to feel the same way? Well, then enhance the overall appearance of your fire pit or fire ring with this Hearth Products Controls ceramic fiber log set. 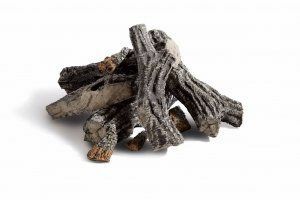 Each log in the set has a realistic, weathered gray and black design - built to last, thanks to the sturdy gel-cast ceramic fiber from which it is constructed. These logs are specifically designed for fire pits and fire rings larger than 36", so be sure that sounds like your own pit. Each of the six logs measures roughly 6" to 10" wide, vary from 24" to 28" in length, and stand anywhere from 4" to 6" high. Make everyone who looks at your fire pit think, "Wow! That is some high-quality wood!" Do these logs need to be removed during winter when temperatures get below freezing? Although not required, it is a good idea to either cover the set or remove it during the off season. In some rare cases, freezing rain or water that freezes on the logs can expand in the various nooks and crevices, causing damage to the logs. The price for these logs was the best I could find. They shipped promptly and arrived via UPS. They were packed up VERY securely in foam that molded around them. They look fabulous in our fire pit! ConsI didn't realize that the logs were flat on the bottoms until they arrived. It's easy to arrange them to hide the flat spots.